Our boycott of the radio lasted less than a week. It was the first week of November and we were getting so tired of hearing about politics we just had to shut off the radio. We could not hear one more Meg Whitman ad without going postal, and we didn’t need to be reminded everyday that the Republicans were going to be in control again only to get us further into a grid lock where nothing in the Senate will ever get done. And let’s pretend we didn’t even write Sarah Palin’s name here (will her 15 minutes ever be up?) We were in political burnout and needed a change from the day-by-day plays in Washington D.C. and Sacramento, along with all the other states. So for four days we stopped listening to the radio and only listened to music on iTunes. On Friday, November 5, that all changed and all I can say is “Thank you” Michele Norris. Your interview with/story of Dori Greenspan on November 5, made me hungry and I haven’t stopped thinking about stuffed pumpkins since. If I hadn’t already had plans that Friday night, I would have gone to the nearest grocery store and picked up a pumpkin at that moment, headed home, and made the dish. But Steve was waiting for me to pick him up for drinks and dinner with a friend. The pumpkin would have to wait. The first version I made was almost exactly like Dori’s with a few minor changes. I loved Dori’s recipe but these sorts of dishes are less about following a recipe to the T and more about playing with a technique – in this case, how to cook stuffed pumpkin. As the title of the recipe suggests, the pumpkin is stuffed with “everything good,” but it should read ‘anything good’ since she gives so many suggestions and alternatives for things to add. So with my substitutions on hand, I sautéed a leek in bacon fat rendered from two bacon slices, then tossed the leeks with bread cubes, and made a mornay sauce (béchamel sauce plus grated cheese) in the same pan I used to cook the bacon instead of adding the cream Dori calls for in her version of the recipe. I probably overstuffed the pumpkin but I didn’t want to waste one piece of cheese or cube of bread. The pumpkin, stuffed with savory bread pudding, was amazing! Our second version was just as delicious but took all too long to bake. We stuffed it with a small sweet potato and a few small turnips along with a half dozen shredded Brussels sprouts. We used the mornay sauce again with the additions of cinnamon and thyme. We didn’t realize the tubers would take so bloody long to cook. We ended up ordering Chinese food that night while the stuffed pumpkin was left to bake for almost three hours. We left it out to cool overnight and then refrigerated it the next morning. On day two, I cut it in half and baked one half in the toaster oven until it was warm on the inside then topped it off with some bread crumbs and butter and finished by toasting it under the broiler. The pumpkin was sweet and roasted while the sweet potato and turnip were just soft and covered with a wonderfully creamy cheese sauce. The bread crumbs gave it a nice crunch. Sweet, savory, soft and crunchy all in one dish! We’re back to listening to the radio now that the election is over. We try not to listen to too much NPR but since we’re both news junkies we can’t help our love/hate relationship with serious radio programming. With Thanksgiving just around the corner we just want to give thanks to NPR and all that they do for us. We may not agree with everything they say but if they want to bring more pumpkin reports we’d be much happier than listening to all the political analysis. The recipes below include the goodies we added to the pumpkins, but as Dori suggests, you can add almost anything you want. Preheat oven to 400 degrees. Cut the top of the pumpkin off, as you would a jack-o-lantern, and remove the seeds (you can save the seeds and roast them too). Sprinkle the inside of the pumpkin with salt and pepper. Add the diced yam and turnips in a medium bowl with the shredded Brussels sprouts, toss to combine. Add mornay sauce to the mixed vegetables and stuff the sugar pumpkin. 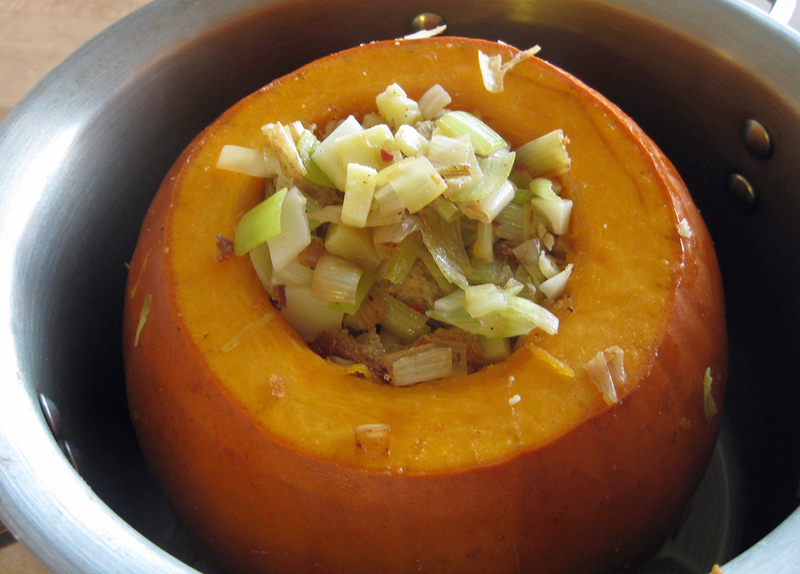 Bake the pumpkin in a pot until the yams are tender, approximately 2-3 hours. Allow to cool to touch, (can be prepared day before, refrigerated). Once the pumpkin is cool, cut in half and top with bread crumbs. If the pumpkin half is cold bake in a 400 degree oven until warm, 20-30 minutes. Finish by toasting the bread crumbs under the broiler for a few minutes until nice and golden brown. Heat milk, onion and bay leaf in a small saucepan on medium until steaming but not yet at a boil then reduce the heat to low to keep the milk hot while preparing the rest of the ingredients. In a medium saucepan, heat the butter over medium heat until melted and starting to bubble. Whisk in flour and cook, whisking constantly, until the flour is just golden and lightly toasted, approximately 4 to 5 minutes. Strain the milk into the butter and flour mixture. Add the salt, pepper and nutmeg (if using) and continue to whisk until smooth making sure no lumps form. As the sauce heats it will begin to thicken. When the sauce is just thick enough to coat the back of a wooden spoon, remove the pan from the heat and stir in the grated cheese. Use immediately. « Older Post Crab and radicchio benedict	» Newer Post Why wait?